Nearly every American with a credit report had their information hacked last year and now your personal information is floating out there on the net. It's a scary fact and millions of people have run to the credit monitoring services to protect their identity. The problem is that these services do nothing to STOP a hacker from stealing your credit. They only alert you when it actually happens. In this video, I’ll show you the only guaranteed way to protect your credit from being hacked – a process that’s better than credit monitoring and that will save you hundreds. Today’s video is the tenth in our debt payoff series, an entire series on ditching your debt from creating those goals that are going to motivate you to some tricks I’ve learned to pay off debt. Think of it like a TV series, at the end of this season, you will have all the tools you need to finally get out from under that crushing debt. If you missed the first videos in the series, click through below to join the community and watch them in order. It's totally free and you'll get everything you need to get out of debt. We’ve worked through almost everything you need to know about your credit in the prior videos from getting your free report to negotiating your debt away. But I’ve saved one of the most important subjects for last. Last year brought maybe one of the worst hacking incidents yet. Equifax, one of the three credit bureaus – the people trusted to hold all your credit information, announced in September that their system had been hacked. Nearly 150 million Americans had their names, social security numbers, birth dates, addresses – stolen by hackers – basically everything someone would need to get a credit card or loan in your name. Even worse though than the company originally reported, it was later found out that over 200,000 people had their credit card numbers stolen and another 182,000 had some other information hacked. One of the worst parts in all this is that Equifax was warned in early March by Homeland Security, four months before the hack, that there was a critical weakness in the company’s security. And they did nothing about it. Look folks, these people are either idiots or criminally negligent or both but they hold all your financial information. If you’ve ever had your identity stolen, and I pray that you never do, it can seem impossible to come back from. Hackers will destroy your credit score, rack up tens of thousands in debt and it’s harder than hell to get it all removed from your report. I’ve talked to people years after getting their identity stolen and they still hadn’t repaired their credit or gotten out from under the problems. The tragic fact is that in this new online world, sooner or later, someone is going to steal your identity. Now there are a lot of services out there to monitor your credit. You’ll get alerts on any credit activity, but this doesn’t prevent identity theft, it only tells you fast when it happens. Plus, these services cost $20 a month or more, $240 a year to protect yourself from hackers. But there’s actually another way, one that will guarantee you stay protected and will also save you hundreds a year. It’s called freezing your credit. Freezing a credit report seals it from creditors or anyone else trying to see inside. 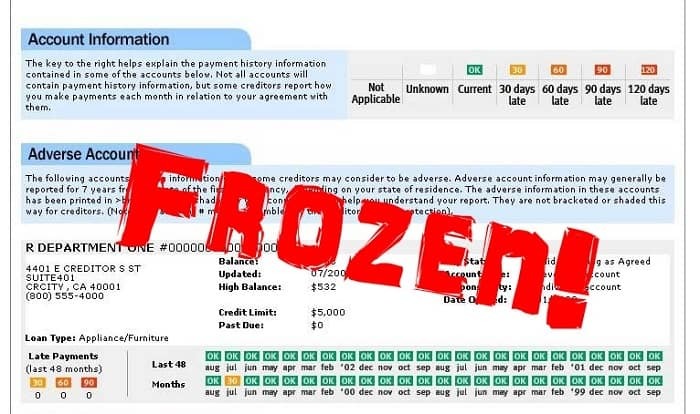 While your credit report is frozen, nobody can create a new credit account in your name. This is actually a great way to stop getting those annoying credit card pre-approval letters also because they won’t be able to access your report. You can temporarily unfreeze your credit if you need to apply for a new loan and then refreeze it. Freezing your credit has absolutely no effect on existing loans or debt. You’ll continue to increase your credit score by building a good payment history on your loans. It costs between $3 and $10 to free each credit report, remember you have three reports. I’m going to give you the website links and contact information for each of the three credit bureaus for freezing your report and then I’ll walk you through the online process for each site. 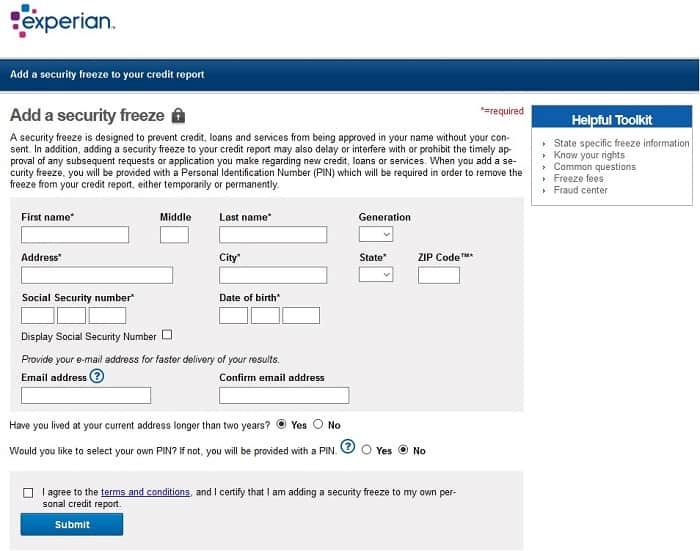 Here are the websites, phone numbers and mail addresses you can use to freeze your credit at each of the three credit bureaus. 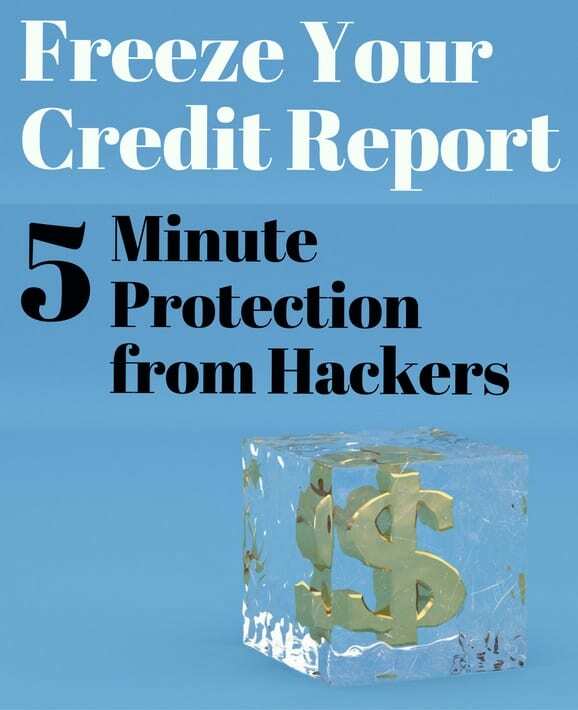 It will take less than ten minutes to put a freeze on all three of your credit reports and protect yourself. You can also call if you like. I used the phone number for Equifax and the process was fast and easy, basically the same as that online but you’ll tell all the information to customer service rather than enter it onto the website. Of course, the snail mail option is going to take the longest. If you use this option, I would recommend going to one of the websites to see what information they ask and then using that in your letter requesting a credit freeze. I’ll show you the three websites for freezing your credit and walk you through the process but it really is super-simple. It’s actually a lot like the process we used in the seventh video to get your free credit report. This is the first screen you see if you click through to the Experian link. They’ve got some links to useful information about freezing your credit on the right here including fees for your state. All the information you need is basic stuff to identify you and freeze the correct report. So you’ll enter your social security number, date of birth and address. If you’ve lived at your current address for less than two years, you’ll also need to list your previous address so they make sure the get the right report. Once you click submit, you’ll see another box with the state-specific fees and a place to put in your credit card information. If you don’t have a credit card, you can call the credit bureaus and you can pay by check or cashier’s check with snail mail. After entering your payment information, you’ll be given a PIN number. You will need this to unfreeze your credit so make sure you keep it somewhere safe. You might want to save the email they send you or just write it down but don’t lose this number. Let’s look quickly at how to freeze your credit online with the other two bureaus then I’ve got a really important warning that goes with all of this. Clicking through to the Equifax website you’ll see an almost identical page. Some basic information up top and then your personal info at the bottom. Equifax was waiving all the fees through June 2018 and for longer in some states. 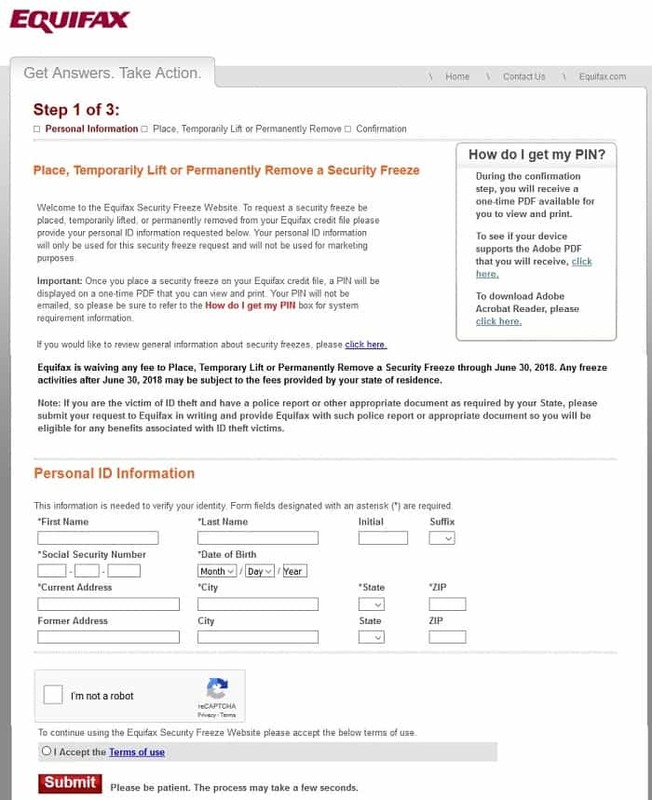 There’s an important note here, if you are the victim of identity theft, you can submit your credit freeze in writing to the three bureaus and they’ll waive the fees. I guess they figure if you’ve had your identity stolen, you shouldn’t have to worry about a few more fees. TransUnion has one extra, massive step here. You’ll first see a screen to either log in if you’ve already frozen your score or to register to freeze your credit. After clicking Register, you’ll see a screen almost identical to the other two bureaus. It really is that easy to protect your identity and your credit report. Now there is a downside to this. While your credit is frozen, you won’t be able to apply for any new loans. Creditors won’t be able to see your report so they won’t be able to approve new credit. You can temporarily or permanently unfreeze your credit by going back to the three sites above. It will cost about the same amount you paid to freeze it so between $3 to $10 to unfreeze each of your three reports. Even paying the fees, it’s still hundreds less than paying for a year of credit monitoring and all those services tell you is if there’s something crazy going on in your credit. Basically credit monitoring is useful to catch identity theft fast but won’t protect you from it. If you haven’t put a freeze on your credit yet, I would highly recommend it. It takes no time, costs very little and is just one less thing you have to worry about. It’s not just that massive Equifax hack where 143 million people got their information stolen. Sooner or later, there’s a good chance that someone will try to hack your credit. Having a freeze on your reports is the only way to make sure they can’t get in.